The impact a successful YouTube channel has on a brand can no longer be questioned. The social media behemoth attracts over 1 billion unique visitors to its platform every month, and some YouTubers now generate full-time incomes because of this traffic. With success stories of certain channels bringing in six figure incomes, more people have looked at YouTube as a way to market their brands. However, as more people use YouTube from a business standpoint, more methods get mixed up and misconceptions lead to mistakes. These are seven mistakes that you must avoid so you continue to grow on YouTube. Uploading YouTube videos at a consistent rate allows your channel to remain active and give your subscribers a good experience. The moment you stop uploading YouTube videos at a consistent rate, you will lose some of your subscribers, and your account’s growth will halt. In order to avoid the stagnation of your account’s growth, you must upload numerous videos at a consistent rate. The amount of videos you should upload depends on your channel and style. With that said, every YouTuber should upload and publish one video every week. Some people may feel capable of uploading and publishing two YouTube videos every week. The more YouTube videos you upload to your channel, the more choices you give your subscribers and potential subscribers. While you give your audience more options, you must ensure value in all of your videos. If the people in your audience do not appreciate the options you made available for them, then they will look for someone else. On YouTube, it is easy for someone to find videos just like yours. That is why your first impression in terms of value is so important for doing well on YouTube. For some people, uploading short YouTube videos is their style. However, the longer videos tend to perform better on YouTube’s search engine. Longer videos tend to outperform shorter videos because YouTube uses minutes watched as an essential metric to rank its videos. It is better from a SEO standpoint when a visitor watches 10 minutes of a one hour video than it is when someone watches a three minute video from start to finish. Retention rate matters too, but the minutes watched metric is more significant for YouTube SEO. The audio of your videos has an impact on how people perceive your channel and brand. If you have bad audio in your videos, people will find it difficult to listen to your videos even if you offer great advice or good humor. The way your videos sound is just as important as the value within the actual videos. If you don’t have any microphone, then your audio is decent at best. I use the Yeti Microphone for my videos, and many of the highly successful YouTubers use the microphone for their YouTube videos and training courses. At the end of every YouTube video, don’t be afraid to ask your audience to subscribe and comment. The best way to get something is to ask for it, but you don’t want to beg either. There is a difference between saying “Please subscribe” and “Please, please, please subscribe.” I have an annotation that shows up during all of my videos enticing people to subscribe, and at the end of my videos, I encourage interaction and subscriptions. I want to make sure the people who appreciated my video the first time can easily get notified about my other videos and have a conversation with me. As you get more experience with uploading and publishing videos, it will become tempting to branch out and create a broad channel. Creating a broad channel is one of the worst mistakes to make on YouTube. When you make a broad channel, you confuse your channel’s identity which will result in fewer subscribers. Let’s say you upload some videos about sports, some videos about fashion, and some videos about gadgets. It would be difficult to gain an audience what that channel because viewers won’t know what niche your channel fits into. Instead of creating one broad channel, create a series of specific channels with one clear niche. By creating channels with clear niches, it will be easier for you to build a strong following on YouTube. As you upload more videos, you will get into specific areas within your niche. Getting into specific areas within your niche will fulfill specific needs and desires that your viewers have. However, your viewers won’t want to scroll through all of your videos to find the one video they are looking for. You can make it easier for your viewers to find what they want by breaking your channel into categories. I have a digital marketing channel, but since there are various components that go towards successful digital marketing, I create different categories based on the videos I have done. I have a social media category and a blogging category because I know that some of my subscribers care more about my social media advice and other subscribers care more about my blogging advice. Breaking my channel into categories makes it easier for both of those subscribers to find what they are looking for in a time effective manner. Just because you put a video on YouTube does not guarantee it will get thousands of views let alone a few million. In order to get more views from YouTube’s search engine, you must generate some of the buzz on your own. When I upload a new YouTube video, I always tweet it and promote it on my other social networks. I have even started sharing my YouTube videos with my email list. I share my YouTube videos with the audience I have already built so more people see the video, and as a result, my audience grows. YouTube is still a leading social network, and optimizing it for your brand’s growth will put you in contact with a new audience. You can use the audience you already built to jumpstart your YouTube channel’s growth. 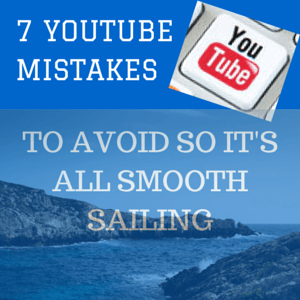 By avoiding these common mistakes, YouTube growth will be smooth sailing, and the results will be more impactful for your business. What are your thoughts on using YouTube for your brand? Do you make any of these mistakes with your YouTube strategy? Do you recommend any other mistakes we should avoid on YouTube? lease share your thoughts and advice below.